when the other lanes are congested. You must keep to the left of these lines (Examples 1 and 2). You may cross them to overtake, or enter or leave the road, or to perform a U-turn where permitted, but you must only do so if it is safe. A dividing line is a road marking formed by a white line or two parallel white lines (broken or continuous) designed to separate the parts of a road to be used by vehicles travelling in opposite directions. park in angle parking on the opposite side of the road. 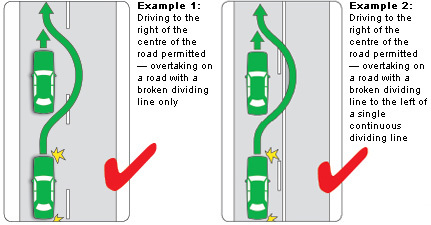 to leave enough room to safely overtake a bicycle rider (examples 4A and 5A). but only if you have a clear view of approaching traffic and can do so safely. You must keep to the left and must not cross these lines, unless you have to avoid an obstruction or, if safe to do so, to allow enough room to safely overtake a bicycle rider (example 6A). You are permitted to cross single or double continuous lines in order to avoid an obstruction - this does not include a slower moving vehicle or a vehicle stopped in a line of traffic, but may include a fallen tree, a crashed vehicle, or a car that has broken down or is illegally parked. Before crossing the line, you must have a clear view of the road ahead and it must be safe. 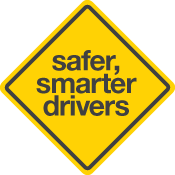 You must also be very sure you cross safely because the onus is on you to assess the danger when doing so.